CND Brisa Gel is a wearable, workable, flexible nail enhancement. CND Brisa is hypoallergenic: containing no acrylates, gluteraldehyde or formaldehyde. It’s also odourless, so it’s perfect for anyone that is sensitive to the smell of other types of nail enhancements. CND Brisa Lite Sculpting Gel is the first truly removable, gentle, light and superior sculpting gel that does not require filing or buffing of the natural nail and is removed gently in only 30 minutes! Brisa lite combines the superior performance of Brisa Gel but with the easy removal of Shellac. Resulting in a high performance gel nail system that can be soaked off in just 30 minutes. It’s kind to the natural nail yet giving the strength that you want from a gel enhancement. Also perfect for an natural nail overlay. The perfect solution to those wanting long “natural” nails but need a little extra care and help. 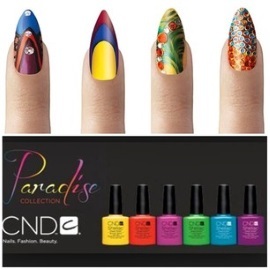 CND Liquid & Powder has been formulated and designed to give you long lasting, lift resistant acrylic nail enhancements that can be worn long, sleek and natural looking. Wear them clear and natural, with colour or go for a custom blended enhancement. CND Shellac Power Polish can also be worn over enhancements for the hardest wearing glossy colour. This option occurs an extra charge. Award-winning CND Shellac™ contains UV3 technology it’s on like traditional nail polish, wears like a gel and it can be removed in minutes with absolutely no damage to the natural nail. Unlike traditional polishes though it offers 14+ day wear, mirror shine and zero dry time. Due to the way CND Shellac has revolutionised the nail industry, Nail Technician’s and non CND salons often claim that they offer “Shellac”, but remember, if it doesn’t say CND on the bottle, then it isn’t CND in the bottle. The Pinkies Polished team have been trained to the highest standard with CND and purchases all salon products and stock through the only authorised CND distributer in the UK ….Sweet Squared. Brisa Lite Smoothing Gel can be used alone, or with CND Shellac & CND Vinylux nail polish. Brisa Lite Removable Smoothing Gel is the power partner to CND Shellac™ extending the wear of CND Shellac by up to an additional 7 Days. It adds a thin, flexible, lightweight protection to perfect and smooth the surface of the natural nail. It’s perfect for natural nail finish, or as a strengthening foundation for CND Shellac. Flawless and natural. VINYLUX™ is a breakthrough nail polish system that endures a week of polish perfection…without a base coat! Exposure to natural light secures the patent-pending technology, creating an enduring, long-lasting polish. While ordinary polishes become brittle and deteriorate over time, VINYLUX dries naturally to a flawless finish and strengthens its resistance to chips over time. Want a Vin. lyux to use at home?? Pinkies Polished can order your favourite colour & with Top Coat for only £15.95 .. Perfect for you or even as a gift.